So, a couple of weeks ago I had this whole plan in my mind wherein I was not going to make or eat any sweets until Valentine’s Day. Not because of any January, ascetic, resolution-y type of reason. I steer clear of food resolutions in general, and cleanses peeve me. They rub me the wrong way, I guess because I feel like they’re a reflection of our national dysfunctional relationship with food. I know they’re not trying to, but to me they send the message, “you can shove whatever you want into your body without paying attention all year long as long as you spend 2 weeks in January consuming nothing but juiced vegetables and wheatgrass,” or whatever. Which you can’t. You should eat cleanly all the time, and it should and can be incredibly enjoyable, and then also leave room for some good clean fun here and there (like nachos, hehe). Anyhow, pardon the brief tirade, that’s neither here nor there because the real reason that I was going to forego all sweets for any number of weeks was to create a giant buildup to a Valentine’s Day treat to end all Valentine’s Day treats. In spite of my usual relaxed attitude toward the holiday of love, this year, for whatever reason, it struck me as a fun idea to use it as an excuse to make something billowing, and chocolatey, and gooey, and basically hopelessly, ridiculously rich. And, I suppose I still may, but a couple of things conspired against me in the last few days to send my plans into a tailspin. First, my dear husband told me that he was going to be out of town on Valentine’s and the surrounding days for a consulting project he’s working on. Insert sad face, but that hitch could be overcome by postponing our Valentine’s celebration until he returned. But the second problem is, I lost my taste for chocolate. I know: What???!!! Right? It’s completely ridiculous. Who goes from being a devotee of chocolate in all its most intense forms, mousse, sorbet, midnight dark bars, dense flourless cakes, to being slightly put off by the very thought of it? Who???? Sadly, me. It may have something to do with a not very good chocolate bar I had a piece of whose acrid taste is still lingering in my mouth. Or it may be, and seriously I think this is the more likely option, that some sort of spirit – like a tooth fairy who’s had a few too many, and has headed out to wreak a little havoc instead of leaving dimes and quarters – snuck in at night and stole my liking of chocolate. In its place it left two odd, squirming changeling cravings, one for romaine salads with creamy tangy dressings (who knows, right? But, more on that in another blog post. ), and citrus. The citrus craving is far less odd, especially at this time of year when citrus is the brightest spot in the produce section. But, what is a bit funny about my sudden desire for citrus is that rather than citrus in savory form (a la preserved lemons and lemon zest), which I always add to everything without a second thought, this was a craving for citrus desserts, something sweet-tangy, like lemon bars or grapefruit sorbet or some such. And this is unusual for me. If I’m going to do dessert, I’ll always zip past the lemon and head toward those with dark chocolate or whipped cream, and preferably both. Maybe I’ll want berries rather than chocolate, but almost never ever citrus. Except today, when lemon curd was the only possible solution to whatever muck of madness there was in my head. Although, in the making, I decided to be ever so slightly more interesting by using a combination of lemon juice and tangerine juice. I borrowed bits and pieces of technique from almost every single curd recipe I’ve tried, and the result is a curd where you reduce the juice, use only yolks no whole eggs, and whisk the butter in vigorously at the end. This still takes only about 10 minutes, and when those 10 minutes have passed (well, plus a bit of chilling time if you don’t like warm curd, but I rather do, so I didn’t wait much at all) you are rewarded with a curd that is silky but also fluffy, resting somewhere between the personalities of its cousins custard and mousse. Tart and sweet, but not too sweet, like spoonfuls of sunshine shipped in from a place where your car easily starts in the morning and the tiny hairs in your nose don’t freeze the moment you walk outside. And by spoonfuls it is easy to eat it. I could have polished it off that way, like a small bowl of lemon pudding, but then part of me, perhaps the part of me that still likes to attend tea parties and wear lace-trimmed hats, decided that one really ought to have some scones around as a delivery vehicle for one’s citrus curd. And so, I quickly whipped up a batch of my favorite scones, scones that I devised for some tea-time visitors a few months ago and have been dreaming of since. They are crumbly and golden, creamy, and as light as if someone had developed a method to suspend butter in air (which, I suppose, is almost what is happening in many flaky baked goods, except the converse, it’s air suspended in butter). They are shot through with fragrant vanilla bean and punctuated with bourbon-soaked dried fruit. And seriously, between this curd and these scones, my chocolate taste buds can stay wherever they are for as long as they wish. I barely remember they’re gone! 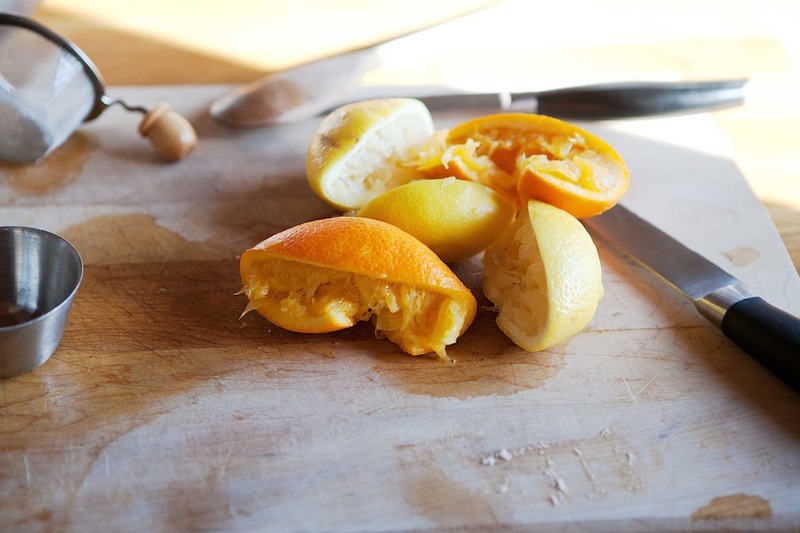 In a small saucepan, combine the lemon juice and tangerine juice and bring to a boil. Turn down to a simmer, and cook until reduced to 1/4 cup. This takes only a few minutes because of the overall small volume. Remove from the heat. 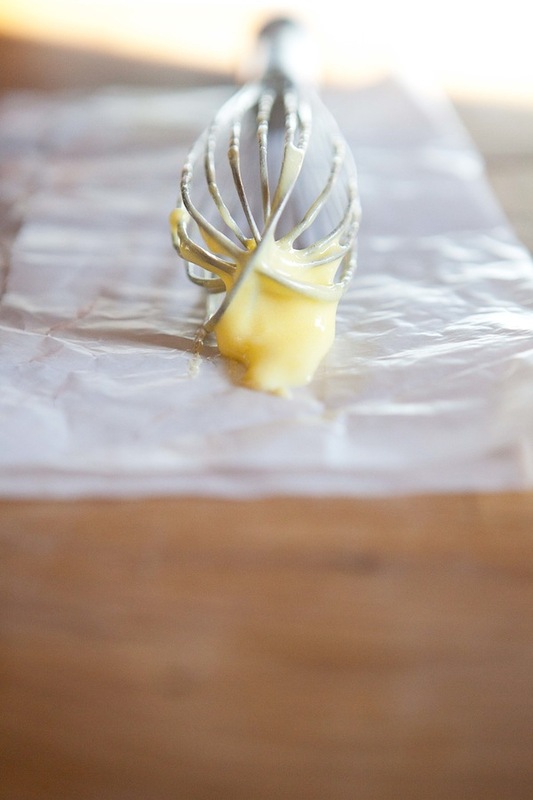 In a small metal bowl, whisk together the sugar/honey with the egg yolks until smooth. Stir in the citrus in a thin stream, whisking vigorously as you add it so the egg yolks don’t scramble. Now, add an inch or two of water to the pot that had the citrus juice, return it to the stove, and place the bowl with the juice-egg-sugar mixture on top of if to make a double boiler. Bring the water to a simmer, and cook the curd over it, stirring constantly, until it is thick enough to thickly coat a wooden spoon, which should take another few minutes. Remove from the heat. Whisk in one chunk of butter at a time, whisking vigorously to aerate the curd, until all of the butter is incorporated. 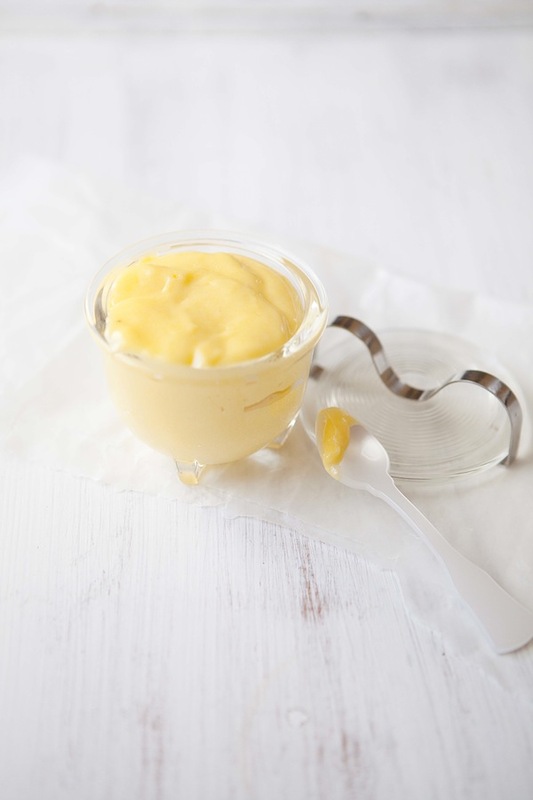 If you prefer a denser curd instead of an airy one, just gently stir the butter in one piece at a time without the crazed whisking. Cover the curd and cool it in the refrigerator before serving with scones (see below), or serve it warm, and store any leftover in the refrigerator, covered, for up to about a week. Curd can also be frozen for up to a month. If you’re like me, if you’ve refrigerated (or frozen and thawed the curd), you’ll want to gently rewarm (over a double boiler again, even) and whisk it before serving to get the creamy texture back. The day before (or several days before) making the scones, split open your vanilla bean. Scrape out the seeds and use your fingers to blend them into the sugar. Then, add the pod to the sugar, put it all into an airtight container, and let it hang out until you’re ready to bake. Remove the pod before baking (you can add it to some other sugar though to make that sugar vanilla-y for future use). Combine the flour, baking soda, baking powder, salt, and 1/3 cup sugar in a large bowl. Working quickly, use your fingers (I prefer fingers because then I can get a better feel for how the dough is doing) or a pastry cutter to work in the butter until the dough resembles coarse meal or sand with a few larger pea-sized butter chunks still left as well. Make a well in the middle of the dry ingredients. Whisk together the eggs, cream, and crème fraîche, and add this mixture along with the (drained) chopped figs/cherries to the well. Stir until everything is just combined. Then, use your hands to gather the whole mess together. Dump the dough onto the counter, and pull it all together into a rough ball, and pat it into a big circle between 3/4 to 1 inch thick. There may be stray bits of dry flour mixture left over that won’t stick to the rest of the dough. Pat on what you easily can, otherwise just leave it, it’s OK. Remove from the oven and transfer to a cooling rack to cool as much as desired. I think scones are the best served while still warm (but not hot) from the oven. But, they are also lovely at room temperature, and will keep for a day, especially if you gently warm them back up before serving. I agree with your thoughts on eating balanced, and I guess when we are mentally balanced it comes easy. 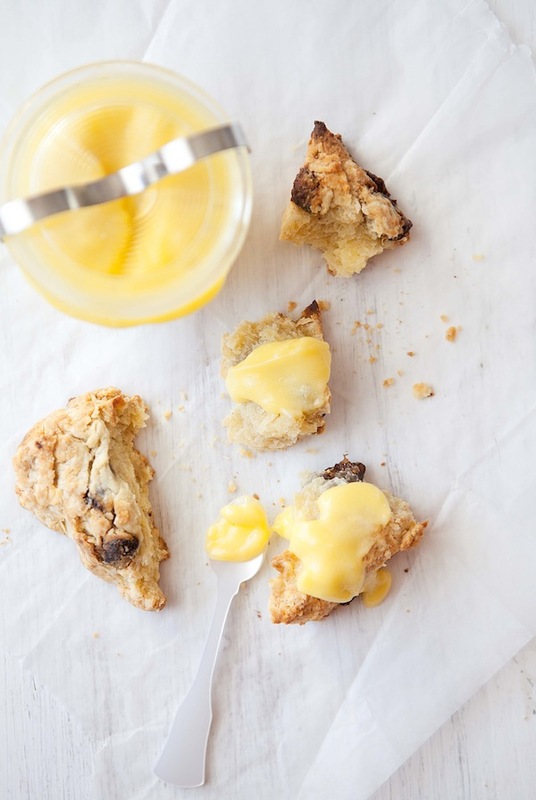 This is a wonderful combination of citrus in a curd, and the scones are fantastic, though I think I´d rather make them without the figs, just vanilla and bourbon… The pics are absolutely gorgeous Emily! They’d definitely be delicious without the fruit as well. Thanks! I have a terrible relationship with scones. They just don’t like me. Every time I try to ‘whip up’ a batch they decide to go all rock hard, or sometimes crumbly and dry. Dry like the sahara desert. But these scones, well, they just look so tasty, and sophisticated. I’m putting these on my ‘to bake’ list. Thank you for bringing them to my attention. PS your photos are beautiful. Oh, I hope you give these a try! I used to always have scones that turned out like rocks. Really keep all the ingredients cold and don’t overwork them, that’s the key. Good luck! I love your 1st paragraph and couldn’t agree more on the cleanse foolishness. So, I’m wondering – no longer like chocolate, new & semi-strange cravings – any chance there’s a bun in a different kind of oven? Scones are my number one favourite thing to make. That lemon curd looks divine and I love the interesting addition of tangerine. This post puts me in the mood for baking! Thanks for the great recipe, I’m off to my kitchen. Scones are one of my very favorites too! It’s a rare day when I don’t crave a scone. 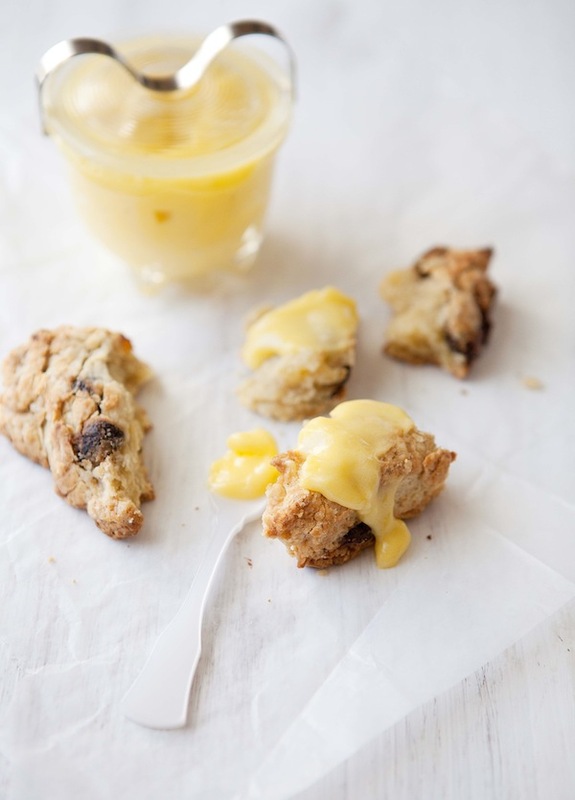 I’ve only recently mastered scones (thanks to Dorie Greenspan) and I haven’t made lemon curd in ages. Now I have a craving! I’m also over chocolate. I blame the two year stint working in a fine European pastry shop (not baking, alas) to turn me off to sweet chocolate and turn me on to butter and fruit. I’d much rather have cake with fruit in it and cream on top than something chocolatey and rich. That being said, I’m a sucker for Lindt Lindor chocolate truffles – especially milk and white chocolate. Funny! I had a similar experience working in a chocolate and pastry shop in Cambridge. I couldn’t stand the smell or taste of chocolate for a couple of years. Then I went back to liking it, now I’m back to not. It goes in waves! Lindt truffles are AMAZING though! I’d much rather have fruit and cream. Just had the most amazing flan at a local Spanish restaurant – not like traditional eggy flan at all – very thick and rich and SUPER creamy. Amazing. I’d much rather eat that than chocolate just-about-anything. 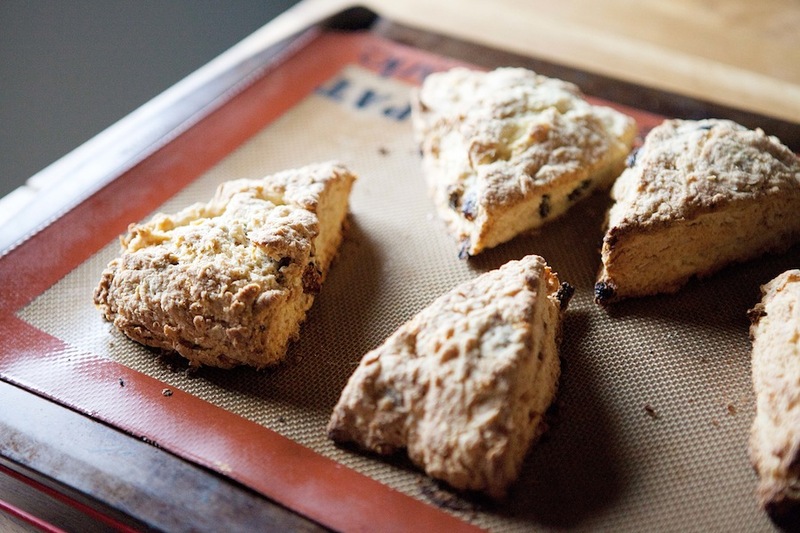 I love making scones, and this combination sounds wonderful! I never crave chocolate, either. I definitely used to. I don’t crave sweets really of any kind (except Reese’s Pieces, now and then!). But oh these scones are calling to me. You make them look so beautiful and effortless! By the way, we loved your Honeycrisp Cocktail last weekend 🙂 Thanks so much! I’m suddenly so stuck on hard cider. Thanks so much! I wish I liked sweets less than I do, but I still get cravings every couple of weeks. 🙂 And, I’m so glad the cocktail went over well. Hard cider is just awesome stuff! 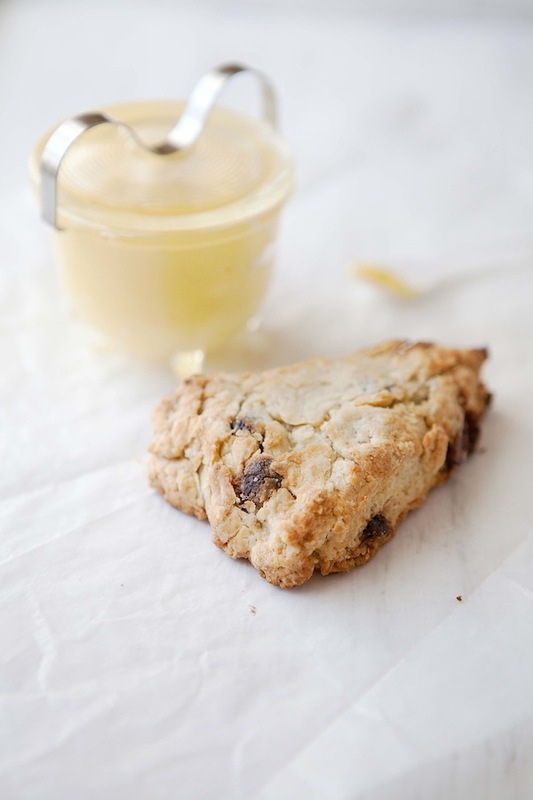 You are currently reading Vanilla bean scones and lemon-tangerine curd at Five And Spice.